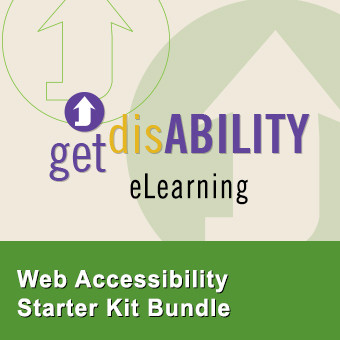 Get everything you’ve ever needed to know about web accessibility and why it’s important in one convenient, time-saving kit. You’ll get our popular Accessibility 101: The Facts Course as well as our Design Course, plus you’ll get The Starter Tool Kit eBook to use as a reference anytime. Who will benefit: An invaluable resource for all of your IT shareholders, web and software developers. Unless they’ve had specific training, most web teams don’t realize what they don’t know about building websites that are friendly toward individuals with disabilities. Protect your organization and your bottom line. Be proactive and give your teams the information they need today in one convenient, money-saving bundle.